When Wyatt gets framed for a friend’s crime, he thinks his life is over. But then a mysterious stranger visits him in jail with an unusual proposal: spend three months in a secret government camp and have a ten-year prison sentence wiped clean. Wyatt agrees, and finds himself in a world beyond his wildest dreams, with teenagers like him flying drones, defusing bombs, and jumping out of helicopters. This is no ordinary camp. Camp Valor is a secret training ground for teenage government agents, filled with juvenile offenders―badasses who don’t play by the rules―who desperately need a second chance. If they can prove themselves over their three month stay and survive Hell Week, they will enter the ranks of the most esteemed soldiers in the United States military. But some enemies of the United States have gotten wind of Camp Valor, and they will do everything in their power to find out its secrets. Suddenly, Wyatt and his friends have to put their training into practice, and find the bravery to protect their country. Wyatt has a decent life, but when his dad takes off, it dissolves into chaos. His mother doesn't function well, his younger brother is clingy, and his aunt Narcissa moves in and is only really helps if you consider snacking on the couch helpful. Wyatt does some stupid things and compiles a small criminal record for himself, but it's enough to land him in big trouble when he is framed for his friend's shooting of a convenience store worker. He is sent to juvenile detention, but given an odd opportunity-- he can go to a summer camp program run by the government and given the opportunity to wipe his record clean by working in covert ops for them. Soon, Wyatt is at Camp Valor, doing boot camp style drills and learning the ins and outs of espionage. In a parallel story, we follow Wilberforce Degas, a more than avid gamer whose father is a crime lord. They are vacationing on their yacht with Wil's friend Chris when things go bad. Colonel Degas is killed, and Wil flees with his mother and Chris. Unfortunately, Chris and his entire family are killed after he leaves, and Wil sinks into a deep depression and becomes the very antisocial, psychopathic hacker, the Glowworm. The Glowworm later meets Raquel, a violet nine-year-old girl, and the two set out to find his father's killer, whom he believes is . 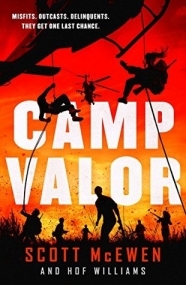 Eventually, his search connects him to the Camp Valor program, and Wyatt's group's training ultimately triumphs, although tragedies occur and there are complications put in place for the next book. Wyatt's descent into criminal behavior, his redemption at the camp, and the complicated twist involving his father make this a riveting read. Teens love the idea of saving the world, and putting them in a camp where they are taught the tools to use to do this is brilliant. The paramilitary aspect will also be popular with readers who like war stories as well as tales of spies. This is definitely a young adult book, and the Glowworm and Raquel are deeply disturbing characters. There is a fair amount of human-on-human violence in this one, and while it isn't lengthy and graphic, there will be occasional scenes where the Glowworm decides to put a bit of his nemeses' flesh into a blender and through his feeding tube. Raquel's background and motivations aren't really explained, but she is brutal and senseless in her killing. This will appeal to some readers raised on crime shows and video games, but was less than appealing to me personally. Readers who enjoyed David Gilman's The Devil's Breath, Muchamore's Cherub series or McNab's Traitor books will love the pulse-pounding action and adventure of this new paramilitary series featuring troubled but talented delinquents who have a shot at redemption.